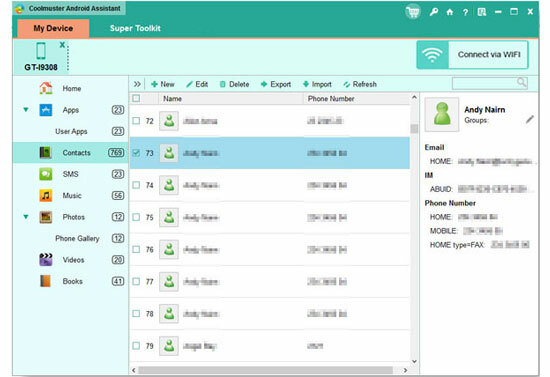 Wireless processes have the advantage of the wired process because when you have the need to transfer files from HTC device to computer, the HTC device and the desktop computer does not have to be in the same location. Instead, the HTC device can be in their home, while the desktop computer can be in the office. Meaning if the user is working on a project at home, they can complete it in the office with ease. 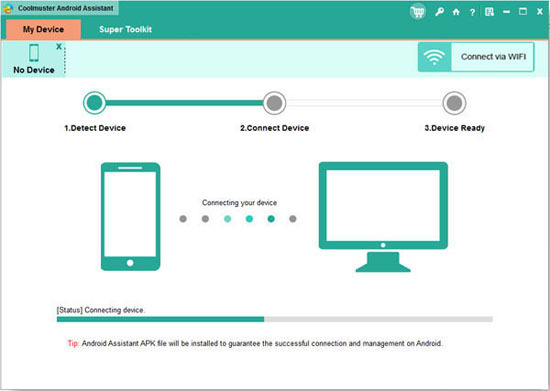 Now, thanks to the Wireless File Transfer for HTC - Coolmuster Android Assistant, you can build the connection between HTC device and computer without a USB cable. By scanning a QR code, you can effortlessly connect your HTC phone to computer successfully. After that, Android Assistant will help you transfer apps, photos, videos, music, contacts, text messages, books and more from HTC One M8/M9/M10/Desire/Wildfire to computer, and vice versa. Now, we guide you through the process of transferring HTC files from/to computer by using this Wireless File Transfer for HTC - Android Assistant. Just click the following button to download it on your computer for free. How to Wirelessly Transfer HTC Phone Data without USB? Step 1. Download and install Android Assistant Apk file on your computer and HTC phone. Then, launch Android Assistnat and choose "Connect via WiFi" option from the upper right corner. Note: Ensure both the computer and the HTC phone is using the same Wifi network. They will have same IP addresses which can be checked to find out. Step 2: Run the APK program on your computer and on your HTC phone simultaneously. Your computer will prompt for granting APK file permission to join the network. Be sure to click on "Allow access" button when the window pops up. Step 3. The program detects the connected HTC device and show all the transferrable file types in categories. Just choose the data you want to transfer to computer and click "Export" button. Or, you can choose the data you want to transfer from computer to HTC and click "Import" button. Want to have a try now? Just go ahead!